Charlie, Anne, and Su were the best of friends. One of the things they enjoyed about each other was that all three of them had the same birthday. One year when their birthday came, the most amazing thing happened. Charlie got an elephant for his birthday! And so did Anne! And so did Su! The three friends were flabbergasted. They looked at their parents, who, truth be told, seemed a little perplexed themselves. But they pulled themselves together and said parenty things like, "Well, we thought you were ready." They also said: "You'll have to be responsible and take good care of it." The whole town was excited. They'd never had elephants in their town before. Many of the townsfolk had never even seen a live elephant. They crowded around the yards of Charlie, Anne, and Su. Soon people were asking to see Charlie and Anne and Su ride on their elephants. Because the three friends often had fun together competing with each other at games, they decided to have an elephant training competition. Who could best train her or his elephant? The townspeople would be the judge. Charlie went to work trying to train his elephant to recognize and respond to voice commands. "Turn left" he shouted -- and tried to coax the elephant to turn left. He also taught his elephant "Go," "Stop," and "Turn right." Anne worked with touch instructions on her elephant. She sat on the back of her elephant's neck and gently tugged on the right ear when she wanted it to turn right, on its left ear when she wanted it to turn left. She rubbed her hand forward on its head to mean go, and she patted its head to mean stop. For weeks the friends used every spare moment to be with their elephants trying to train them. And usually there were several townspeople gathered to watch, because it was so interesting. 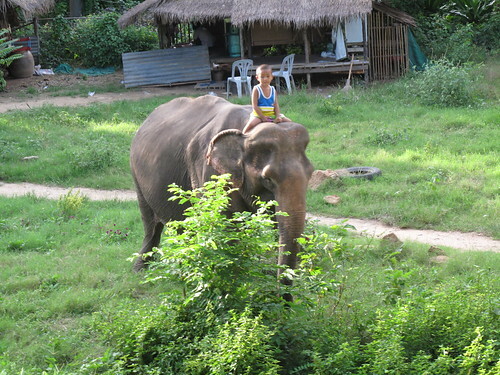 But whenever anyone went by Su's yard, all they saw was Su sitting up on her elephant, looking thoughtful and not doing much of anything. When the day of the contest came, the whole town gathered around the town baseball field. Charlie brought out his elephant, and got up on its neck. "Go," he shouted. And the elephant went. For the next 5 minutes, Charlie shouted various instructions: "Turn right...Stop...Go...Turn left." The elephant usually did as it was told, though sometimes Charlie had to shout the same command several times before the elephant did it, and on one occasion, the elephant never did turn left, as Charlie was calling out for it to do. Still, the townspeople were impressed. They clapped and cheered and several hollered out, "Good job, Charlie!" Then Anne brought out her elephant. She climbed up on it and soon began giving the touch commands. She pulled -- but not too hard -- on one ear, or the other. She rubbed its head to go and patted its head to go. The townspeople could see what she was doing, and they could see that the elephant usually complied. Sometimes Anne had to tug or pat or rub repeatedly before the elephant complied, and once it never did obey. Again the townspeople were impressed and clapped and cheered and some of them shouted, "Good job, Anne!" Then Su came out and mounted her elephant. The townspeople held their breath in a moment of suspense. Then they saw Su point forward, and the elephant begin lumbering in the direction she pointed. They saw that she pointed left and the elephant curved its path around to the left. They saw hold her hand up, and the elephant stopped. The elephant always did as Su indicated, and always did so promptly. The townspeople declared Su the winner. Afterwards, they asked her how she did it. Su explained, "I spent a lot of time sitting on my elephant, and I learned to feel what it was about to do. When I could tell it was about to go forward, I pointed forward. When I could tell it was about to turn left, I pointed left. When I knew it was coming to a stop, I held my hand up." The townspeople couldn't decide whether Su was very wise or they had been bamboozled. Go to sermon, "The Divided Self"